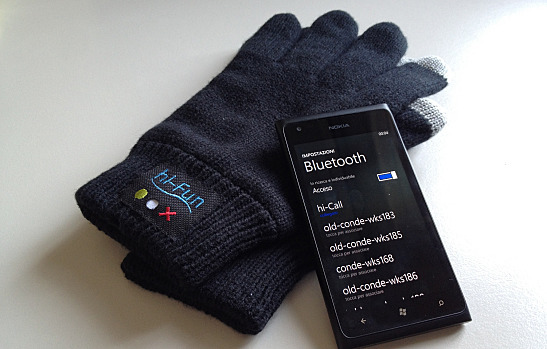 To save sensitive hands from freezing when texting, many companies have developed capacitive gloves that allow the user to work a touchscreen without taking them off. But hi-Fun went one step further: the hi-Call glove allows you to take a call directly to the glove, without touching a cold phone to your face or fiddling with a headset. Just hold your hand up to your face in the universal phone call sign—thumb to the ear, pinky to the mouth—and speak into the glove. The hi-Call glove is compatible with any Bluetooth-enabled phone, and the built-in battery can last for 20 hours of talk time. There are buttons to answer a call and hang up on the wrist cuff, and the glove can vibrate to alert you to a call. But more importantly, it allows you to walk down the street pretending you’re pretending that your glove is a phone, while actually using the glove as a phone. Joke’s on everyone else. Backcountry skiers, snowmobilers, and other winter adventurers constantly face severe danger from avalanches. Avalanches are difficult to predict, and current methods involve digging a snow pit to analyze the snowpack, a process that can take half an hour for a single point and gives limited, subjective results. AvaTech’s SP1 is an electronic probe that analyzes the snow in milliseconds, then shares that information on the AvaNet cloud-based platform through a Bluetooth link to the user’s smartphone. With many people submitting data, the network can develop an accurate picture of the snow stability for every aspect and elevation in an area, drastically increasing backcountry travelers’ ability to predict avalanches. Due to the volatile conditions, users are still encouraged to exercise caution when venturing outdoors, even with the help of the SP1. Cold temperatures have an annoying tendency to drain batteries on phones and other electronics, so it’s always nice to have a power pack to recharge your mobile device in a pinch. Cobra’s JumPack, which is small enough to fit in your pocket, can charge your phone via USB, and it can even jump your car if the winter weather leaves you stranded or your spacey friend leaves their headlights on all night. For emergencies, the device has an LED flashlight with strobe and S.O.S. functions. Never leave home without it, and you’ll always have a power boost when you need one, whether for your phone or your car. In addition to this list of the best new gadgets, there is the typical barrage of electric warmers for everything from steering wheel covers and heated slippers, to boots with retractable metal cleats. What’s your favorite winter gadget?